Russian public Mash has published a photo of a man who allegedly committed a terrorist attack in a Kerch college. The young man supposedly went into college building with a gun and blew up the bomb. “Photo of a terrorist. Everybody is looking for this person in Kerch now. He entered the school with weapons, opened fire, and detonated a bomb. If you see him in the street, leave now and call the police,” the first message said. Later, the public reported that the body of the shooter, who committed the terrorist attack at the Kerch Polytechnic Collage, was found in the building. He shot himself. It is also noted that the second photo of the shooter was taken on the campus before the attack. He entered the building in the same clothes and then changed it. 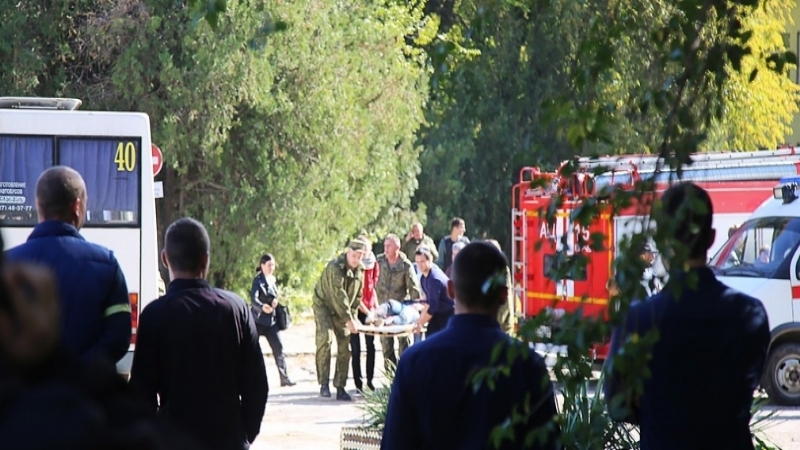 The “head” of the Crimean government, Sergey Aksenov, said that the person who committed the terrorist attack at the college in Kerch, was a student of this educational institution, he was 22 years old. Meanwhile, it became known that the number of those killed in the attack in college has increased to 18 people. The “head” of the annexed Crimea, Sergey Aksenov, declared three days of mourning in Crimea in connection with the explosion at the Kerch Polytechnic College, according to information on Facebook page. “In connection with the tragedy in the Crimea, tomorrow, a three-day mourning will be announced,” Aksenov wrote. According to him, all necessary measures are being taken to assist all the victims.